Mephisto Demos is a double 12″ bootleg vinyl from Groove Records. This is a fairly rare and once highly sought after bootleg of Jane’s Addiction due to immense misinformation perpetrated by the bootleg designers. This bootleg leads you to believe it contains eleven otherwise unavailable Jane’s Addiction demos, including a song that is bundled with the claim that it won Jane’s Addiction a recording contract with Warner Brothers. This is simply 100% untrue, and the fact is there are only five Jane’s Addiction tracks on this bootleg, and they all appear on side A of record one. These tracks are demos that are extremely common demos that have been commercially released several times and are also included on other bootleg albums. The other three sides of this set contain songs by other bands, none of whom have any relation to Jane’s Addiction other than those bands also had sent demos to Triple-X records in the mid 1980’s. 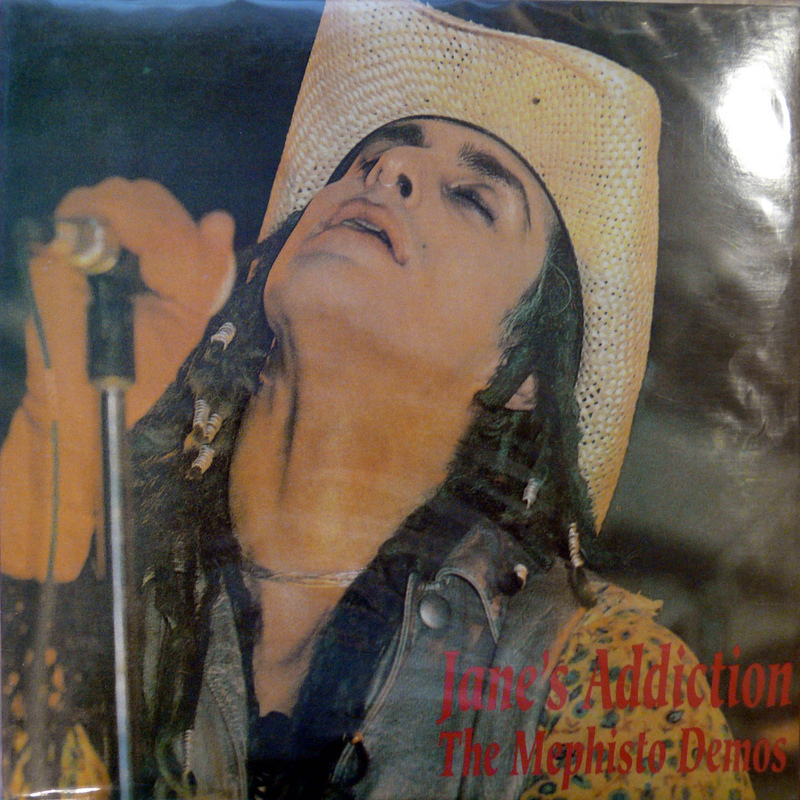 This bootleg falsely claims the final track on this collection as quote: “All White People Look Alike was the cut that won Jane’s Addiction their current recording contract.” This myth further grew to be that Warner Brothers thought that, because of this song, record label reps though that Jane’s Addiction was more like the band They Might Be Giants. Again, this is simply untrue. This twenty minute long song is actually a song by Brian Woodbury, released in 1987 on the label Some Phil. Furthermore, the band They Might Be Giants was barely known back when Warner Brothers signed Jane’s Addiction. The song Fighting Back is an early version of a song called Can You Feel, Forever or Never and Holding Stare are demos submitted to Triple-X records from a band called Cygnet. Fighting Back would later be updated and released by Cygnet lead singer Allan Aguirre’s band Spy Glass Blue and appears on the band’s album titled Shadows. The songs Mephisto Waltz Part 1 and Mephisto Waltz Part 2 are tracks believe to be from the band Mephisto Walz. The actual titles of these two songs is still unknown. The songs Pissed off Krishnas From Hell Part 1 and Pissed Off Krishnas From Hell Part 2 are demos from the Los Angeles based band Pissed off Krishnas From Hell. This band was never notable and ceased to exist by 1987. These two songs likely furthered the rumor that these were Jane’s Addiction demos as one of the many stories about the dissolution of Perry Farrell’s pre-Jane’s Addiction band, Psi Com, was due to members leaving the band to become Hare Krishnas. The song Minglewood Blues is a cover of a Grateful Dead song by an unknown band. The origin of the remaining songs is still unknown. Thanks go out to SDW for the assistance uncovering the origin of some of these songs.